Oral and Maxillofacial Surgeons Marvin Green, D.D.S., and David H. Hanson, D.D.S., M.D., opened The Lincoln Park Institute for Oral & Cosmetic Surgery in a newly built-out 6,000 square-foot facility in January 2005. While the doctors moved their existing clientele to the new location, the Institute was essentially a new business with many new offerings and challenges. The new business had a medi-spa, greater emphasis on cosmetic surgery, Chicago’s first i-CAT imaging machine, and a desire to create a separate imaging business. All the while, the Institute’s core business – oral surgery – needed to be maintained and grown. SHERMAN communications and marketing created a strategic marketing communications and public relations plan to help the Institute better understand its competitors, referring dentists, existing and prospective patients, and a broad array of challenges and opportunities. The plan also outlined a brand identity, key messages, objectives and a comprehensive list of strategies and tactics – providing creative recommendations for everything from patient relations to collateral materials to Web initiatives to media relations to a proactive dentist-relations program. Approaching reporters and editors with stories highlighting the Institute’s comprehensive array of offerings, medical expertise, patient-friendly and state-of-the-art facility, and new procedures. Securing positive coverage about the doctors’ accomplishments and new certifications in newsletters written for professional medical associations and area hospitals. Positioning the doctors as expert resources on oral surgery and practice management to general dentists – their key source of referrals. Assisting with employee morale, communications and evaluations, including developing a standard form to help with employee performance reviews. Fully leveraging the Institute’s prestigious JCAHO accreditation (earned Summer 2006). Reviewing and advising on print, broadcast and interactive advertising opportunities. Writing, editing, negotiating and placing several advertisements. Creating a variety of high-end collateral materials to showcase the practice, its offerings and the doctors’ expertise and patient-focused approach. Initiating mutually beneficial partnerships with a variety of organizations – from Children’s Memorial Hospital to the Lincoln Park Chamber of Commerce. Developing a strategic plan, logo, tagline, positioning statement, procedures, brochure and Website for the doctors’ separate imaging business, Chicago Maxillofacial Imaging: www.superiorimaging.org. Providing ongoing counsel on a wide variety of issues, opportunities and challenges. Cover story and six pages of photos and editorial in the June issue of Dental Practice Report (a national publication with a circulation of 100,000+). Feature stories in several local newspapers, such as Chicago Sun Times, Pioneer Press, Inside Lincoln Park, Skyline Newspaper, La Raza and others. Dr. Greene serving as the “For Your Business” columnist for the Chicago Dental Society CDS Review bimonthly magazine for two years. Each full-page article featured Dr. Greene’s photo, website address and phone number. 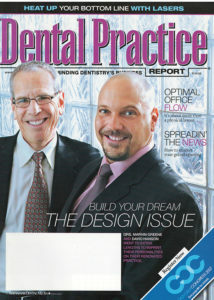 The CDS Review reaches all dentists in the Chicagoland area, with total circulation of 8,150. Bylined articles written to help with practice and patient management in the CDS Review (in addition to Dr. Greene’s column), Chicago Health Magazine, and several national publications including: American Dental Association (ADA) News, Dental Economics and Dental Practice Report. Feature story on Dr. Hanson and motorcycle safety in the Chicago Sun-Times, The Doings and Road Runner Motorcycle Cruising & Touring (largest-circulation publication of its kind with 160,000+ readers). Multiple TV interviews/stories on Univision (the most watched Latino TV network) and CBS. Articles in nearly 10 trade magazines and newsletters announcing the Institute achieving JCAHO accreditation, which reached the doctors’ peers and other dentists. Improved advertising efficiency through screening and judging all advertising opportunities and editing all copy. Produced a four-color, eight-page brochure, three inserts, and custom folder to differentiate and distinguish the Institute and Drs. Greene and Hanson with patients, dentists and other sources of referrals. These high-end collateral pieces also helped to educate and instill confidence in the Institute among these audiences. Produced more inbound, web-based leads by greatly improving the Institute’s existing website in all respects, including overseeing search engine marketing and optimization. Our efforts produced first-page search results in Google, Yahoo! and MSN search engines. Increased goodwill and referrals from dentists. Generated more business, stronger relationships and goodwill with community groups and sources of referrals, and further strengthened the Institute’s brand equity. SUMMARY: SCM helped to launch and build this medical practice via strong media relations, marketing communications, referral programs + much more.